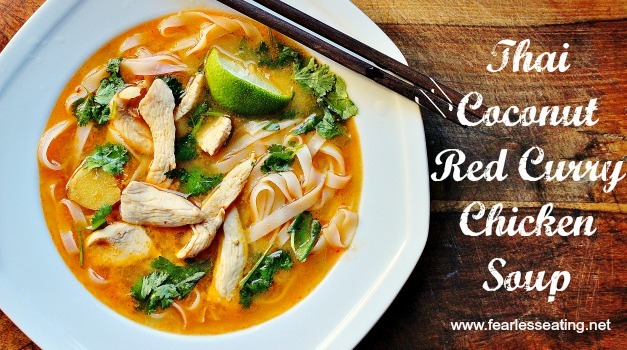 I don’t think it’s humanly possible to dislike this Thai Coconut Red Curry Chicken Soup recipe. One of the big reasons is that the coconut milk and added sugar make this sweet! Considering all the anti-sugar hysteria that now runs rampant through our culture (much of it for good reason), you might be surprised to see added sugar in this recipe. Contrary to popular belief, sugar is quite common in Asian cuisine, including even in their soups. However, in the presence of a real broth with other proteins and vegetables, sugar is metabolized more slowly than say, a soda on an empty stomach or a sugary breakfast cereal followed by a sugary coffee drink. And the problem with sugar isn’t sugar itself, but rather refined white sugar which is detrimental to human health when over consumed. There are now many types of less refined, organic sugars available. In particular, a good match for this recipe would be coconut sugar which comes from the coconut tree. In Asia, palm trees (which includes the coconut tree) are tapped for their sap in the same way that maple trees are tapped in the northeastern US. The sap is boiled into syrup and then made into sugar. If you can’t find coconut sugar, use another type of good quality organic cane sugar. See my broths and soups resources page for a list of good quality sugars. Bottom line, you don’t have to fear sugar in small quantities from good sources! 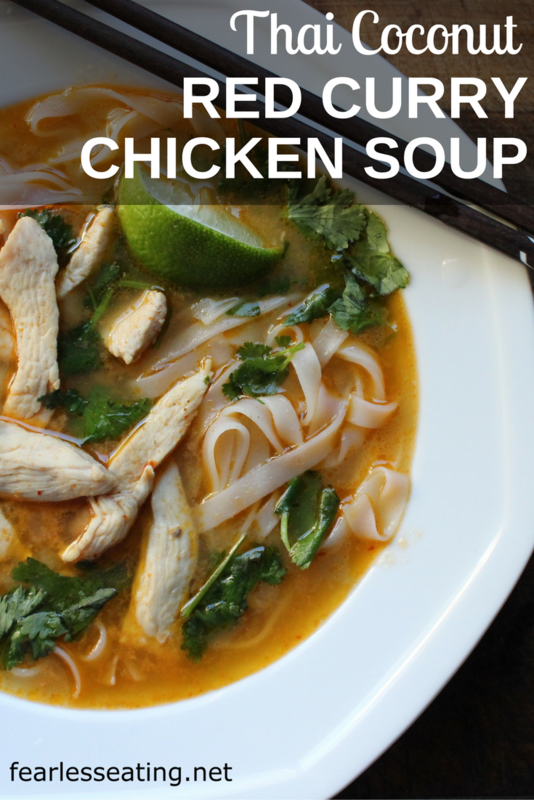 This Thai Coconut Red Curry Chicken Soup is a great way to enjoy sweetness in a healthy way. A simple soup of coconut milk, chicken and red curry paste seasoned with lime, fish sauce and fresh Thai herbs. Fish sauce I add about 1 TBSP per bowl. Add the chicken broth and ginger to a sauce pan and simmer gently about 10 minutes. Add the coconut milk to the chicken broth and simmer a few minutes more. While broth is simmering, prepare rice noodles according to package directions. Drain and rinse with cool water and set aside. Remove about a 1/4 cup of the broth to a separate bowl and mix in the curry paste. Return to sauce pan and thoroughly mix. Taste and add more if you desire more spice. Add chicken and simmer a few minutes until cooked through. Place a handful of noodles in bowls and ladle soup over noodles. Season to taste with sugar, fish sauce and lime. Top with fresh cilantro or Thai basil. 1. Add any veggies you want. 2. Adjust the amount of coconut milk to your liking. One 14 ounce can may be enough. 3. Pork, beef and seafood are all commonly used in different coconut curry recipes in Thai cuisine. They would all work in place of chicken here. 4. Different types of Thai curry pastes are commonly available in American supermarkets. A green or massaman curry paste would work just as well here in place of the red. Green is often a spicier and massaman is usually quite sweet (so additional sugar may not be necessary). See my broths and soups resources page for a few recommended Thai curry paste products.